Honey Irani is billed, not inappropriately, in the manner normally reserved for the likes of Dog Moti and Pedro the Ape Bomb. Our story opens at a hospital, where a nurse (Bela Bose! 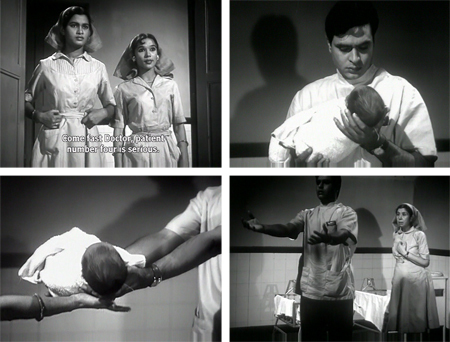 I was thrilled to see her in such an early film, and in a pretty large role too) informs Dr. Anand (Rajendra Kumar) that his pregnant wife has just been admitted. Before the day is out, Anand’s wife has died although the baby boy survives; and another pregnant woman—a recent widow—named Ratna (Meena Kumari) has also been admitted. 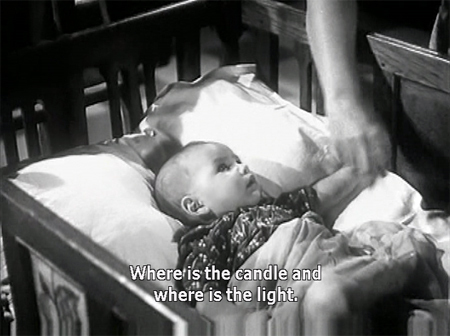 This time she survives while the baby dies, and when she asks to see her baby Anand takes pity on her weakened and sad condition and sends her his son. The only witness to this act of generosity is Nurse Sarla (Neelam Bai) who thankfully does have the good sense to ask if he knows what he’s doing. Had I been the hospital Chief of Staff, I would have sent him home from work after his wife died and told him not to make any hasty decisions—but then we wouldn’t have a plot, would we? Anand leaves town now to try and forget his tragedy, while Ratna settles in with her new son and brings him up with the help of her mother-in-law (Mumtaz Begum). Four years pass, and Anand finally returns to take up work at the hospital again after getting some sage advice from…well, a sage. What could he possibly be yearning for, I wonder! I really adore the picturization of “Chal Mere Ghode”—I so hope that Honey Irani remembers filming that song with Meena; it must be a special memory indeed if she does (I am enthralled by Meena’s acting out the story and I’m technically a grownup)! So sweet sad Anand is back in town longing to see his little boy, who is thoroughly and adorably bonded to his awesome mother. It doesn’t take long for Raju to bond with Anand either, when Anand comes looking for him. Who doesn’t love a rishtaa that’s written in the stars (and the blood)? And beautiful lonely Ratna gradually forms her own attachment to the handsome lonely doctor. What could possibly interfere? Well: the rules of society and small-minded nosy people, of course, beginning in Ratna’s own home. Ratna’s busybody sister-in-law Kamla (?) has moved in with her husband, lawyer S. Prakash (Sunder) and their little boy Ramu. 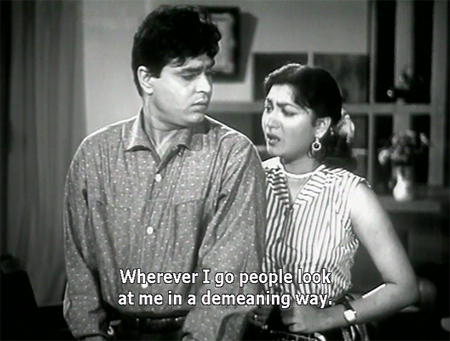 She disapproves of the widowed Ratna spending time with Anand, even with Raju as a chaperone. Soon her disapprobation has spread to her mother, and poor Ratna is forbidden to let Anand meet her or Raju. At the same time, a selfish and ill-tempered nurse at the hospital named Maya (Minoo Mumtaz) has set her heart on marrying Dr. Anand, even though he is patently uninterested in her. She sets out to trap him and with the help of other petty judgmental people succeeds in forcing him to marry her. This works out about as well as you’d expect, which is to say not at all. Maya is only interested in shopping and partying, and she proves unable to have children as well. Once again I am forced to conclude that I have more in common with the vamp of the piece than the heroine. She sings a fabulous song on the occasion of her cat’s birthday, “Aaye Ho Toh Dekh Le.” The poor cat is flung about quite mercilessly, but it’s too much fun. Look up all the songs online, do. Each one is a gem. Now we have three miserable people—Anand, Ratna, Raju—and the situation seems at an impasse. Then Anand’s estranged but wealthy father dies, leaving Anand’s child (should he have one) the bulk of his estate and a Rs 10000 a month allowance. Maya’s eyes go *k-ching k-ching* at this news, but she can’t have children. Guess who her aunt is? 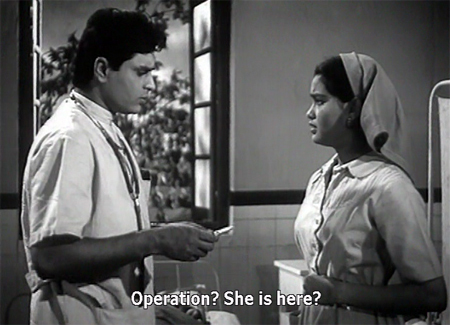 None other than Nurse Sarla—the only person besides Anand who knows Raju’s real parentage. Will heartless Maya force Anand to tell the truth? Can Ratna give up the little boy she has raised and thought was her own? What about poor little Raju? Will society ever learn not to interfere in the personal lives of its people? It never makes them happy. Besides the gorgeous songs, the performances are outstanding. Meena is great as Ratna, a mother but a woman too, and she has nice chemistry with Rajendra Kumar (who is perfectly adequate as heartbroken Anand). Honey Irani really IS a wonder child in this: Raju is sweet and unself-consciously hilarious and adorable—not irritating. I was totally invested in his well-being and in the relationship between mother and child. And I need help identifying two more people: one is the woman who played Kamla (SK Prem? or Kusum Thakur?) and the other is a man I see everywhere—he played a prosecutor in this. Maybe Ravikant? Posted on June 23, 2010 at 3:54 pm in Hindi movies	| RSS feed You can skip to the end and leave a reply. Hello Memsaab. I don’t know if you know me as one of your new readers. Another well-written review. I also love watching Hindi films especially from the 1960s. 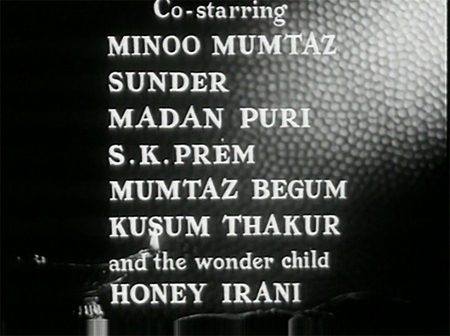 Btw the billing that was given Honey Irani in this film was rather commonly given to kids who played a major role in any film from that time. I recall the kid in ‘Ek Phool Do Mali’ being given a similar epithet although personally I had found him rather annoying. Sajid Khan, Sunil Dutt’s younger version in Mother India was rather more deserving of that title but don’t remember if he received it. Once again congratulation on a great blog. I have been hooked. I love that you can bring a new and fresh perspective onto things and therefore lend greater objectivity as well. And are not afraid to voice your opinions about the so-called greats which if done by an Indian is considered nothing short of sacrilege. I am generally not afraid to voice my opinions about anything :) and glad that you appreciate it! How right you are! The pre-60s were really progressive! I had nearly forgotten all the songs of the film. I thin they must have showed this film at least 3-4 times on DD when I was small. 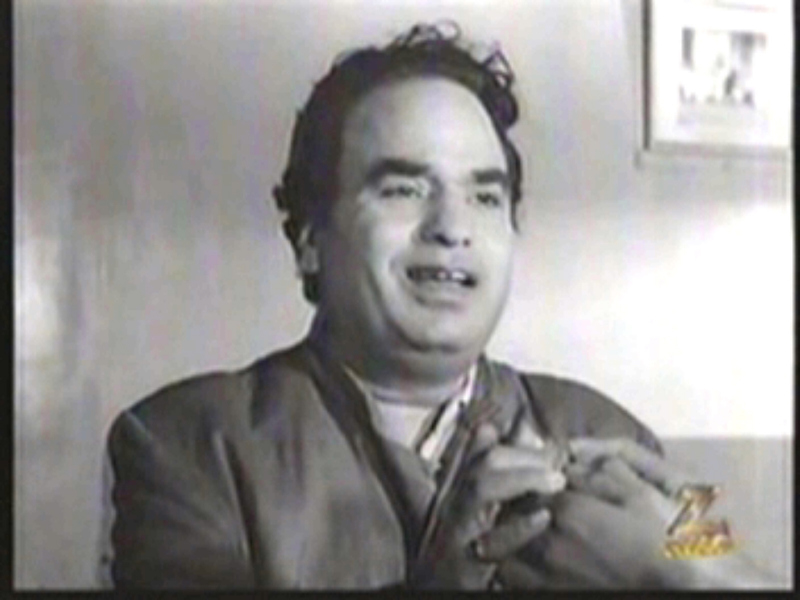 Rajendra of the 50s and early 60s is so adorable! And Meena ka jawab nahin! A pity that Minoo didn’t get more dances! Well she got two and seriously that cat birthday song is FAB even if I cringed on behalf of the poor kitty :) Love the songs, and loved Rajendra and Meena together. It’s just when it comes to meena Kumari. Its my feeling that she is unfairly accused of crying. Most heroines in most films cry at least once if not twice. I agree that in some of her last few films (as heroine) she has tragic roles and may not be liked by some, but other than those the rest of her films, according to me, just have normal amount of crying. Those songs were fantastic. “Chal Mere Ghode” was adorable! Thanks for posting them. I love Meena in it, as the King and the Magician :) Just great, so simple and sweet but compelling. Lovely review, Greta. One can see that you liked this movie. 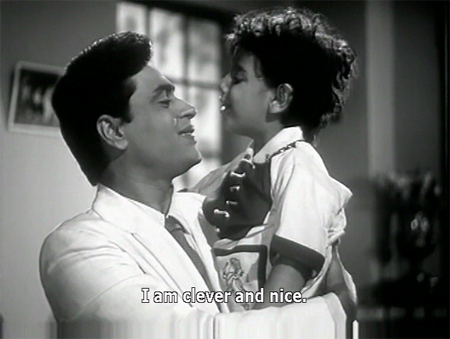 :-) Pretty decent and apparently progressive storyline, good acting by Rajendra Kumar and Meena Kumari, a cute kid (for a change ;-)), Minoo Mumtaz, lovely songs – what’s not to like? “Chal Mere Ghodey, tik tik tik” is a 100% “this song is in THIS movie?” moment for me. I know this song from as early as I can remember (and I daresay, rather presumptuously, that most kids of my generation would have known this song from a very early age, it was THAT iconic a song for kids!). Till I read your review, I did not even know that it was a movie song – I just grew up with it without knowing its background. That nurse angle may have reminded you of DAAPP. As such, Rajendra Kumar and Meena Kumari were also in Dil Ek Mandir, one of the landmark movies of 1963, having also Raj Kumar and lovely songs. 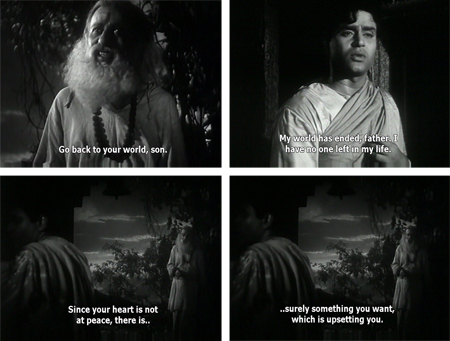 CKRK reminds me a bit of Ek Hi Raasta (1956), BR Chopra’s movie about widow re-marriage. 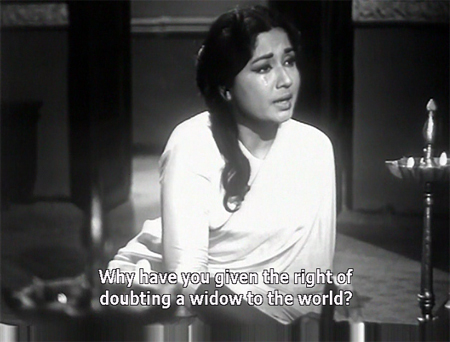 Meena Kumari is such a delight when she does not do her weepy act. I am a big fan of hers – she was really beautiful, with a wonderful smile. And I always found her a very good actress too. She was just lovely in Aarti, for example. And of course, the fun-filled Miss Mary. I’ve been singing that song to my Gemma all morning (she’s deaf, fortunately). I too love non-weepy Meena. She did do some weeping in this but it was justified! and she and Honey were just the best mother-child pair. Ravikant is one of those people whose name I always see, and this guy is one of those people whose face I always see. Would be nice if they go together!!! Ohh my gosh, I think this little cat needs to go to the Masala Pradesh Filmi Pound! I would be pretty flattered if I was a cat to have such a lavish party and such a funky song devoted to me! Poor cat forced to dance! This looks like a good film for Rajendra and Meena who make a a nice couple and I cant resist any Irani kid! I’ve seen much more of Daisy than I have of Honey and I think I like Honey better :) Yes, poor cat did not look that happy! I have to re watch this again soon .) but with so many veterans in this, MUST watch for those who have not seen it. This sounds much better than the other Meena Kumari-Rajendra Kumar starrer I’ve seen in the recent past, Akeli Mat Jaiyo. Dil Ek Mandir was a little too tragic for my liking, though it had great music. I haven’t seen either of those…I am not a big fan of tragedy :) This is really a charming and sweet film. I liked it very much. I’m going to go see the songs now, didn’t know ‘Chal mere ghode tik tik tik’ was from this film. 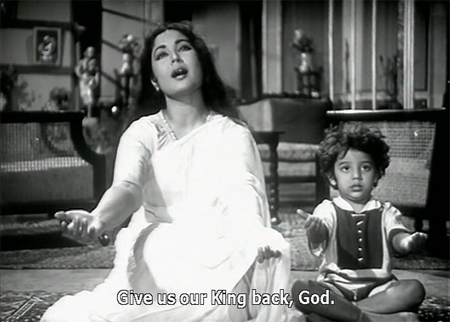 I think Meena Kumari was always lovely with kids, kind, and loving and fun too. Daisy Irani did a similar film with her and Sunil Dutt, and Ashok Kumar – B. R. Chopra’s ‘Ek hi Raasta’ with a more tragic end. 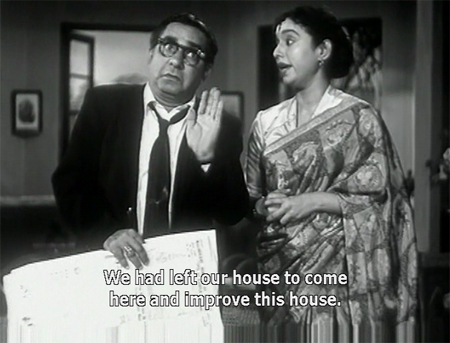 :( And Daisy Irani was one spoilt brat in that. The two sisters made such adorable little boys, didn’t they? So bright, and confident. here both the talented sisters are there. I managed to get a VCD of this wonderful movie, unfort lot of it is cut but then again I am glad of whatever I got, it brought back big hall nostalgia from back home in NAIROBI. Yes, Master Raju is my favourite too. And Master Alankar, who played quieter roles. Pallavi Joshi’s brother, and is now a doctor, I think. Here we have the same problem with our Bollywood, a guy like Ravikant who did a wonderful job in many movies as a lawyer, doctor etc is uncredited in majority of the phillums, I am 99 per cent sure it is him, saw him a few months ago in Raat Aur Din (1967). 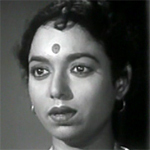 The lady, 90 per cent sure she is Kusum Thakur, if we see Jhoola from 1962, here she played Sushila. What happened to her, no1 knows ! I am huge Meena Kumari fan and I had no clue that the iconic ‘Chal Mere Ghode Tick Tick Tick’ featured her. A big thanks! Honey Irani reminds me of song ‘Main Bambai Ka Babu’ from Naya Daur . These a brief moment of delight in the song when Honey does some awesome head bopping. Memsaab, chal mere ghode tik tik is something most Indians grow up with. I now want to see this movie after reading your review though I am not very fond of Rajendar Kumar (saw Saathi and that soppy movie with sadhna that has the song bedaardi balama tujko mera man yaad karta hai – name eludes me right now) earlier on. Neither am I fond of weepy Meena Kumari movies. But this one sounds good – perhaps i should include it in my next shopping list! B&W does put me off. Both Daisy and Honey Irani were superstars on their own those days. They did have a certain brightness and intelligence. Masters Raju and Alankar are indeed good child actors of the 70s. Filmbuff – the movie in question is Aarzoo (1965) starring Rajendra Kumar, Sadhana and Feroz Khan. The songs of the movie are gems though with lyrics by Shailendra and Hasrat Jaipuri and Music by Shanker and Jaikishen. Direction by Ramanand Sagar. Nirupa Roy wud beat all hands down as far as cryin’ n weepin’ is concerned in Bollywood, ofcors. Yeah I agree with Pacifist Meena was called The Tragedy Queen because of her tragic roles she played. 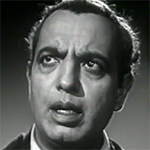 Interesting bit on Daisy, she was credited in Hum Panchhi Ek Daal Ke (1957) as Roop Kumar …. Chatpat !!! This movie had very good songs composed by very under rated Dutta Narvekar Bhau. daadi amma daadi amma maan jaao	and sung by Asha and Kamal Barot, I do not recall who played the kiddie roles when this song was picturised. I am sure one of them was Daisy? must check my phillum one day again. She played tragic roles and WEPT ALL THE WAY THROUGH THEM. And yes, Nirupa would be in contention for the most weepy Maa ever anyway. She wasn’t weepy in her heroine days though, at least not in the films I’ve seen. The kiddie Child actress Sonu was splendid, now according to imdb, Sonu is male ? and was quite a all rounder. Btw Meena’s earlier phillums also, a few, were not weepy weepy like for eg. I’ve seen lots of sparkly beautiful laughing Meena in films from the 50s…that’s what makes me so sad about what happened in her life and her career. I would love it if she were STILL around, sparkling and laughing as she did then :) I’ve written up three of the films on your list here I think. This reminds me of another movie, that had an excellent subject and Meena played a very different role, unfortunatey the ending wasn’t good, it seemed like the director just lost interest at the end and wanted to complete the movie asap. The songs are good too. Check it out. Movie – Chand *ing: Meena Kumari, Manoj Kumar, Balraj Sahni, Pandari Bai. Directed by Lekhraj Bhari and music by Hemant Kumar. OMGosh, I am throwing a party exactly like that video of “Aaye Ho Toh Dekh Le” for Cat Freddy on his next birthday! But def wud hv loved to see her more in bubbly roles, def capable of any role, she died far too early. and yeah just u/l for DO readers this beautiful song from Kabuliwala, a kiddie number which was very famous, still is and quite hard to get. 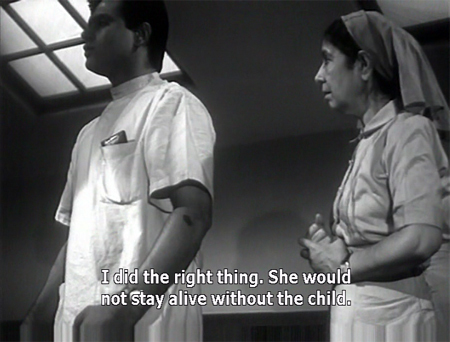 Ash – I recommend you watch Azaad (1955) which stars Dilip Kumar and Meena Kumari. She’s got a lighter role and the movie also a treat. I used to have a VHS, which got destroyed, so a replacement and a rewatch is very much due, never miss any movies of Chitalkar Bhau, he was Maestro of Music. Btw just putting up soon another Dilip-Meena starer- Yahudi 1958, super duo of SJ with the magic baton. And a full load of Veterans like Helen, Cuckoo, Minoo Mumtaz(rare to see all 3 together), Indra, Baby Naaz, Murad, Nazir Hussein, Sohrab Modi, Anwar Hussein, Nigar Sultana, Tiwari. A must watch to catch up these folks. and the movie has hard coded Subs Memsaab ! I have not checked if yu have already seen and done a review, if yu have pls excuse for over looking. I I would love to see the movies all of you are mentioning ie Meena Kumari in non weepy roles. Alas, i think most of them must be in B&W – am rarley enticed to see B&W movies unless it is really good like Anupama, Seema, Bandini, Sujatha, Anari etc (not bad list himm for some one who does not like B&W)! S Saw this movie last night. The ending was a real surprise coz I kept thinking – it will end tame. U r right about movies in 40s and 50s being more progressive. Perhaps it had a lot to do with the subcontinent’s history at that time – tragic loss of lives and the upheavel that followed partition plus the fact that we had some progressive film makers who were bold in addressing social customs that needed to change. What ever, minoo mumtaaz and Bela Bose were a real delight. The scenes bet Minno and Honey were really good. Songs were fab. this is some amount of news about meena kumari.